For Travis Flock ’16, the blue catfish became the perfect pathway into the real world of science. Eight months ago, the Mooresville, IN, native was just beginning his work as an intern at the Smithsonian Environmental Research Center (SERC), tracking the invasive species as part of a long-term study to aid in future management strategies. 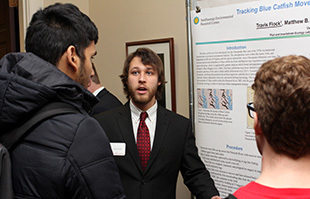 Last Friday, he was in Detchon Center presenting his findings to peers and professors at the Celebration of Student Research, Scholarship, and Creative Work. The journey has been invaluable for Flock. The learning began immediately, as Flock was introduced to fieldwork, where the conditions can be the opposite of the pristine environment found in laboratories. According to Dr. Matthew Ogburn, SERC Research Scientist and Flock’s primary investigator, it isn’t for everyone. After embracing fieldwork, blue catfish movement became the focus for Flock, as he continued work on a study to find and use data that could aid species management strategies in the future. His efforts were bolstered when he inherited a big dataset from the previous year that had yet to be analyzed. That opened up the possibility for deeper connections. What Flock saw in the data were fish that covered more than 200 kilometers from December to July – from the northernmost stations almost to the mouth of the river in the Chesapeake Bay. In terms of management, blue catfish were incredibly mobile, which could be the key behind their impact on the watershed. Flock was able to return to campus and to continue crunching numbers. It was not simply gathering and analyzing data and building the correct charts and graphs. Statistical tests – linear regression and significance tests to be specific – were necessary to prove the validity and strength of the data. Those findings came with a sense of relief for Flock. After a long consultation with Dr. Ogburn, they proved that he had read and interpreted the data correctly. 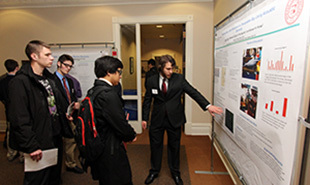 It also capped a time that had seen him working with the data deep into the fall semester. While the study will continue under SERC’s guidance for two more years, Flock’s attentions have turned to other projects. Following his presentation Friday, he looked back on his experiences and felt good about the results. Flock feels the work he’s done – from the tributaries of the Chesapeake Bay to the floor of Detchon Center – has helped him to enter the professional academic world, an entry that might have waited until graduate school if not for SERC and the Celebration of Student Research, Scholarship, and Creative Work. Flock already has his eyes open to whatever opportunities await. After a summer on the water, he’s hoping to diversify his portfolio with new and different challenges.